Experiencing Los Angeles: Experiencing Matt Logue's "Empty L.A."
A couple of years back, when we were living in Los Angeles, the L.A. Times did a story on photographer Matt Logue's book "Empty L.A."
Logue's book is a series of photographs of normally busy spots around Los Angeles, but with (thanks to some amazing "Photoshop" editing) people and vehicles removed from sight. 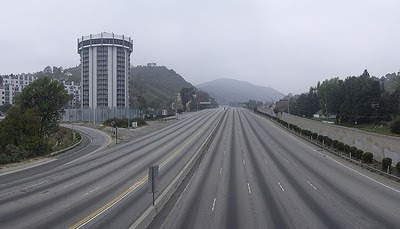 The above photo of the San Diego Freeway at Sunset Blvd - normally packed at all hours of the day - looks surreal. Almost eerie. 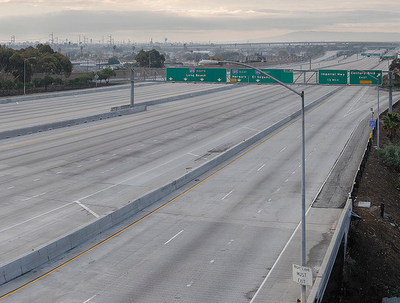 I was most impressed with the empty freeway shots. 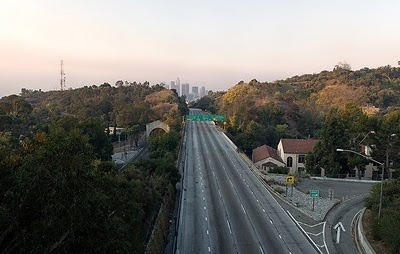 This is the Golden State Freeway (Interstate 5, or "the 5") looking south towards downtown. There are also numerous street shots. I can't pinpoint this intersection - the neighborhood reminds me of the area around the Beverly Center. Emptier than Christmas morning . . . I'm not sure why he missed the three parked cars on the right. But, otherwise, nothing on the streets. Below is another shot of the San Diego Freeway (the 405) past LAX, looking south towards the 105 Freeway. Looks like a river of concrete. A very lonely river of concrete. "How desolate lies the city once so full of people" wrote the Hebrew prophet Jeremiah (Lamentations 1:1). While I found Logue's photographs creative, they were also disturbing. OK, disturbing might be too strong of a word. Unsettling. There was something unsettling about them. It's people, not buildings or roads, that give cities life. "This is is what the LORD says - he who created the heavens, he is God; he who fashioned and made the earth, he founded it; he did not create it to be empty, but formed it to be inhabited." Isaiah 45:18. An empty city, a really empty city, is a dead city. It's stuff of apocalyptic science fiction movies. Remember I Am Legend (2007)? The Will Smith film is a remake of both The Last Man on Earth (1964) and The Omega Man (1971). But even these "empty earth" films had someone. Otherwise there wouldn't have been much of a movie, would there? Even the animated Wall-E had a lone mechanical character on earth. 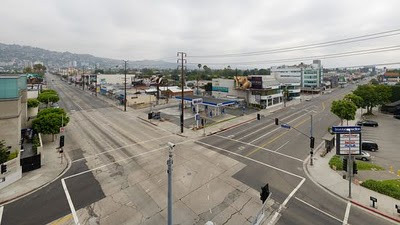 I'm sure every who's lived in Los Angeles and been stuck in mind-numbing traffic has dreamed of an emptier city, or at least fewer cars on the road. Instead of an emptier city, I wonder if L.A. would be better off with more people? Not more cars. More people. Cities like New York, London, Paris, Tokyo seem to function better with more people, not less. 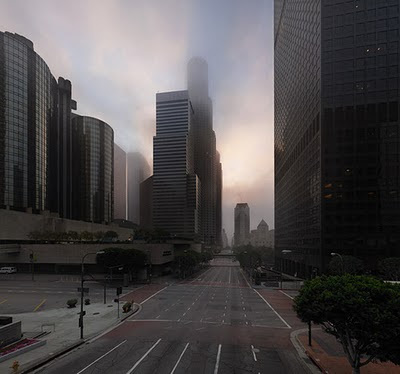 Perhaps Matt Logue's next project might be showing us what Los Angeles would look like with twice as many people. Now that would be interesting. 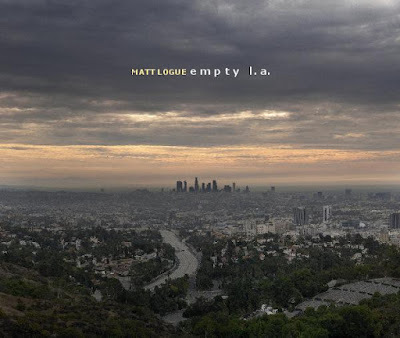 Labels: Empty L.A., Matt Logue, Matt Logue's Empty L.A.